The truth is that I went into this project with absolutely NO PLAN! I bought the floor tile because I loved it, and then have been figuring it out as I go! 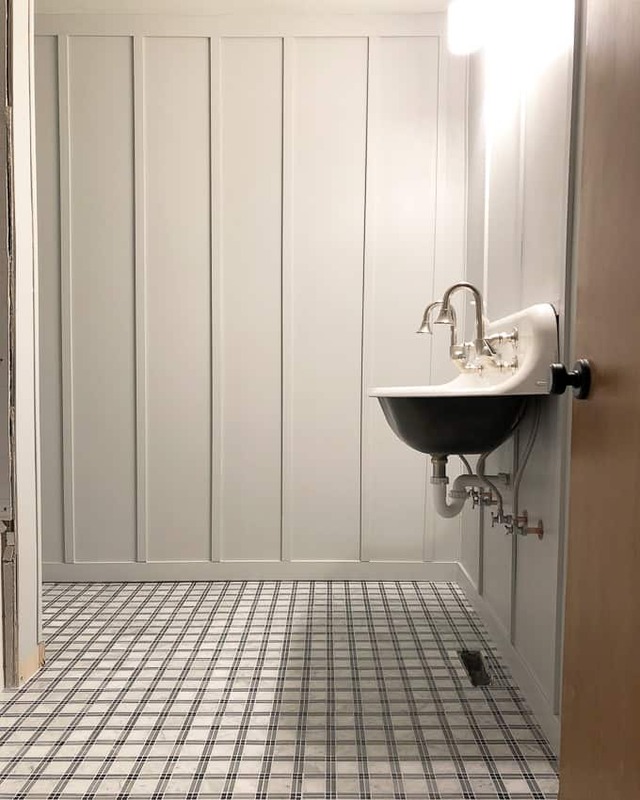 After installing the tile I came across “The Sweet Beast’s” board and batten bathroom and I knew that I wanted to replicate the look in here. 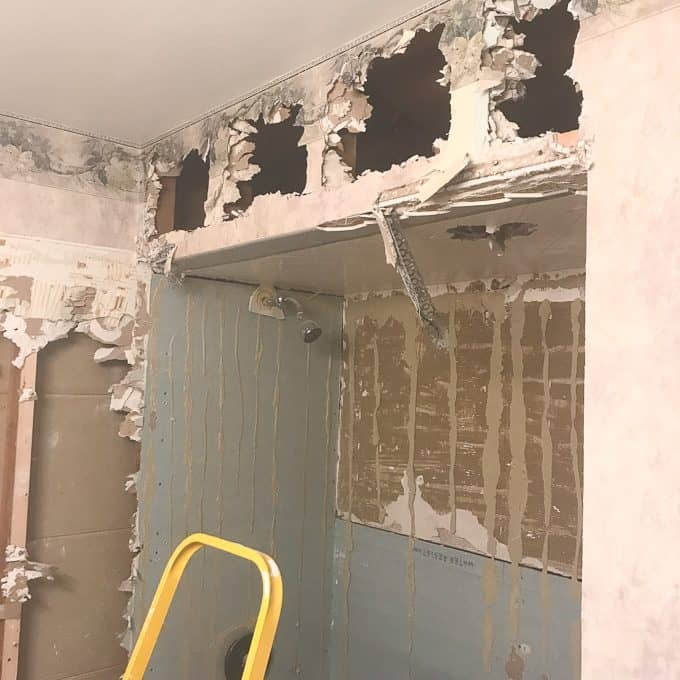 Although it looks somewhat finished, the truth is that the ceiling drywall repair isn’t finished, the electrical still needs work, and the tub hasn’t been tiled or plumbed in yet! 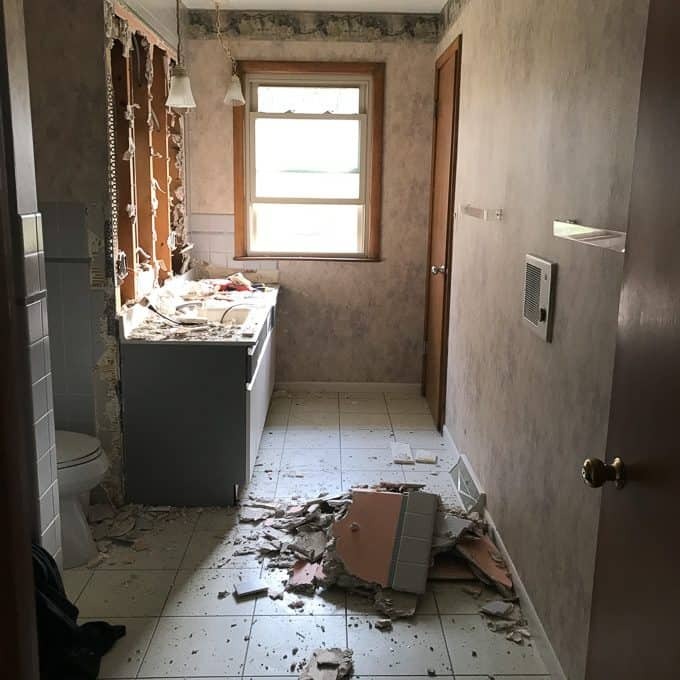 My goal has been to get this bathroom done before my kids get out of school for the summer, and as of today they have six days left! 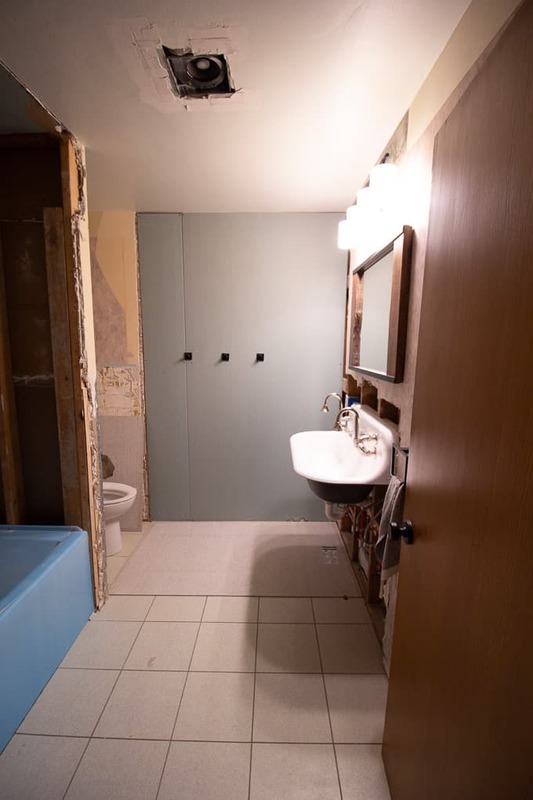 I should probably be drywalling or tiling rather than writing this post! Let me take you back to how far this hall bathroom has come! 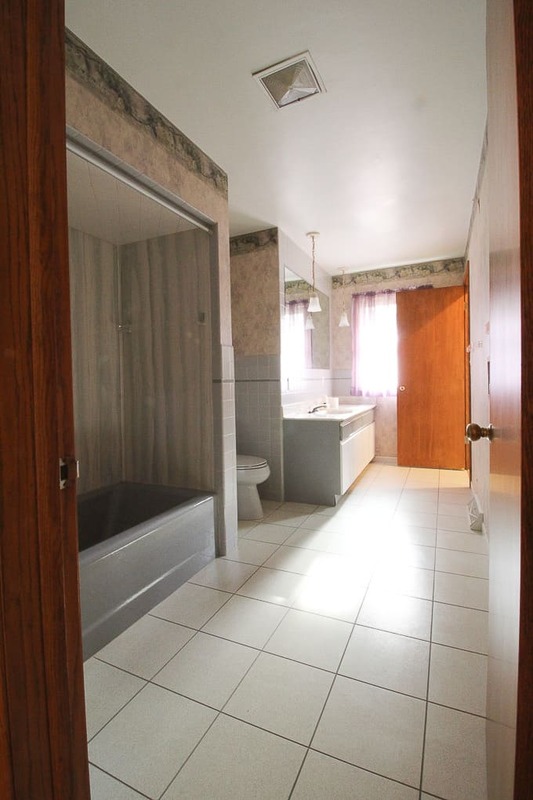 This was the bathroom the day we bought the house! It was 14 feet long, with a door into the hallway, and another door into the kitchen. Although the natural light and window was awesome, it was wasted space since our master bathroom didn’t have a shower and we could steal this space for a shower. 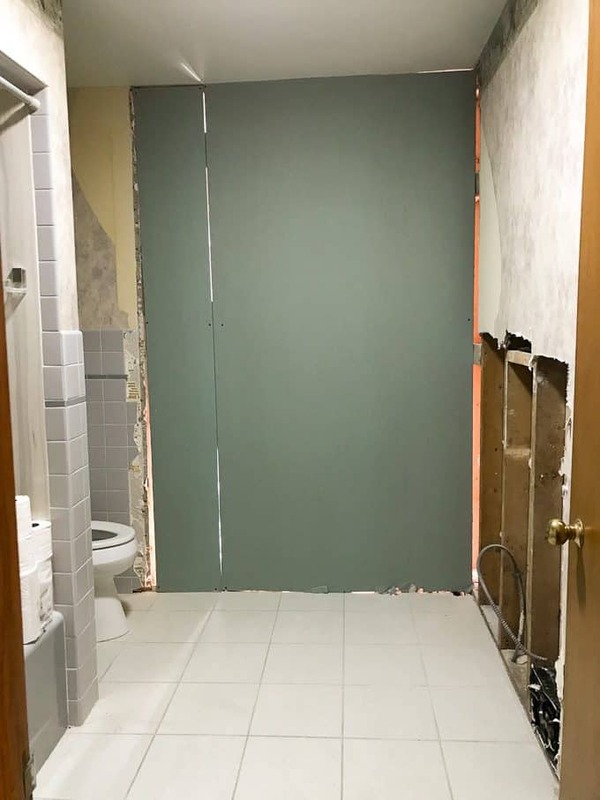 So we closed off the doorway, framed in a wall, and cut this bathroom in half! 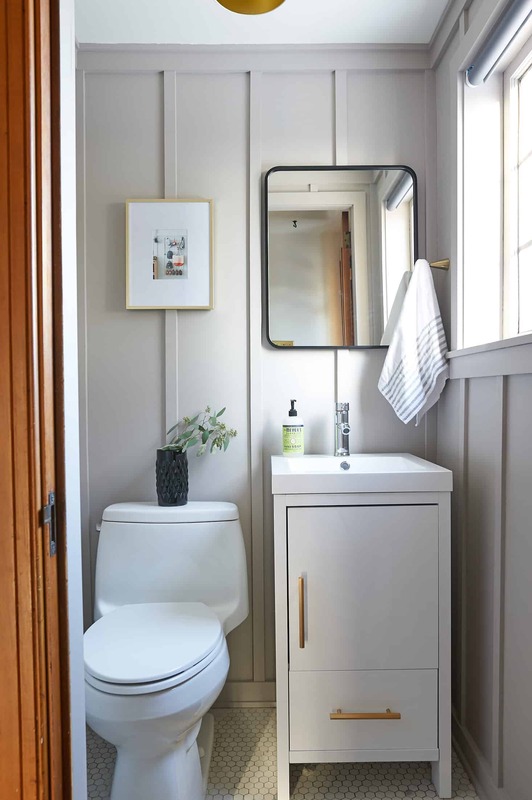 **post contains affiliate links** Because the vanity was eliminated, we had our plumber add this beautiful Kohler Brockway sink, and then we lived with this completely unfinished bathroom for the past six months. 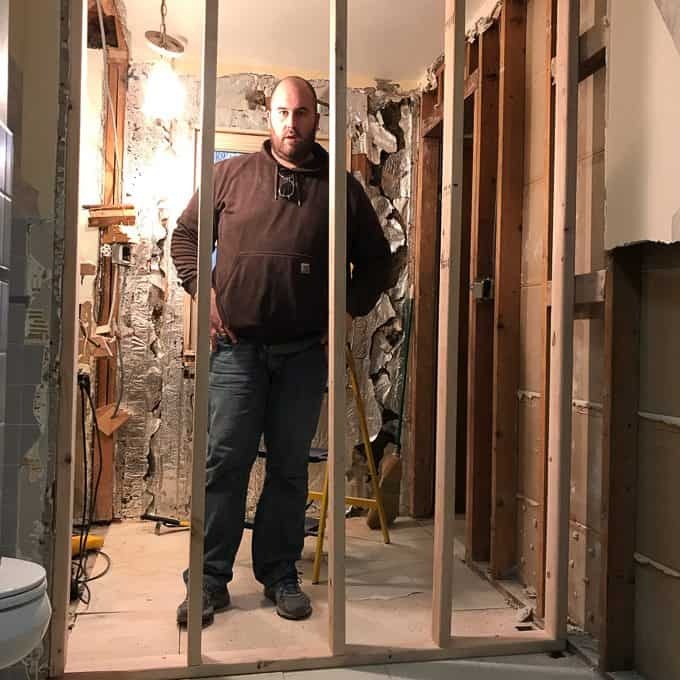 Over Mother’s Day weekend I got my request of my husband helping me demo the tub and surround. It weighed over 400 pounds and he had to destroy it with a sledgehammer. Then last week our plumber came and installed our new tub. I went with this one that I really love because of it’s depth and clean lines! 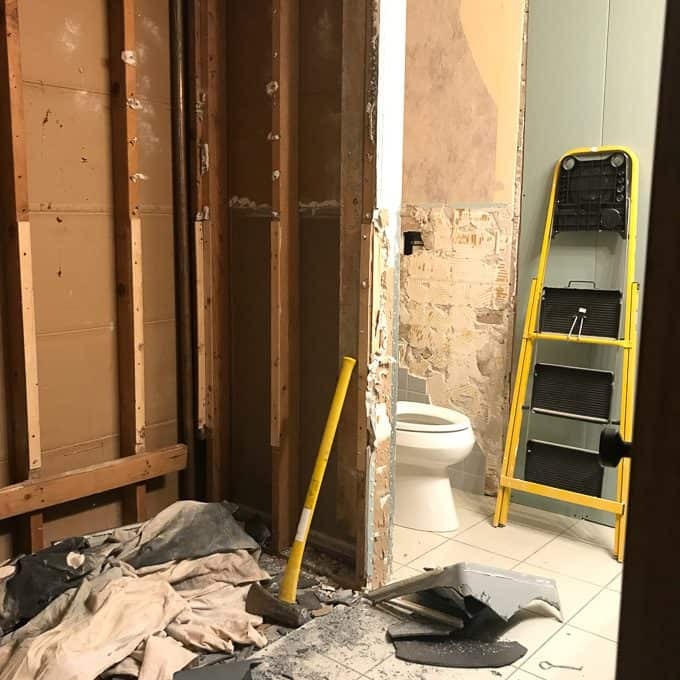 Once the tub was installed I removed the toilet and installed cement board everywhere. 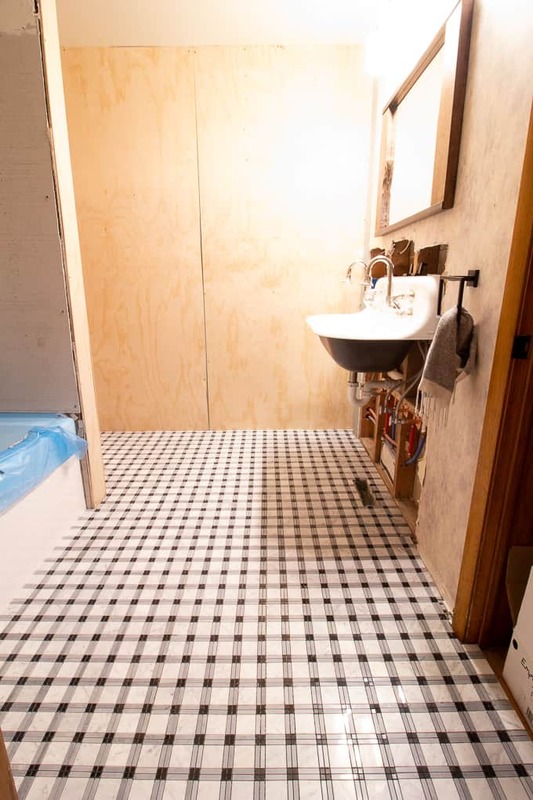 Then I installed this gorgeous tartan tile and started repairing the drywall on the walls. Once all the walls were patched I avoided mudding and sanding drywall by installing sheets of plywood over the drywall. 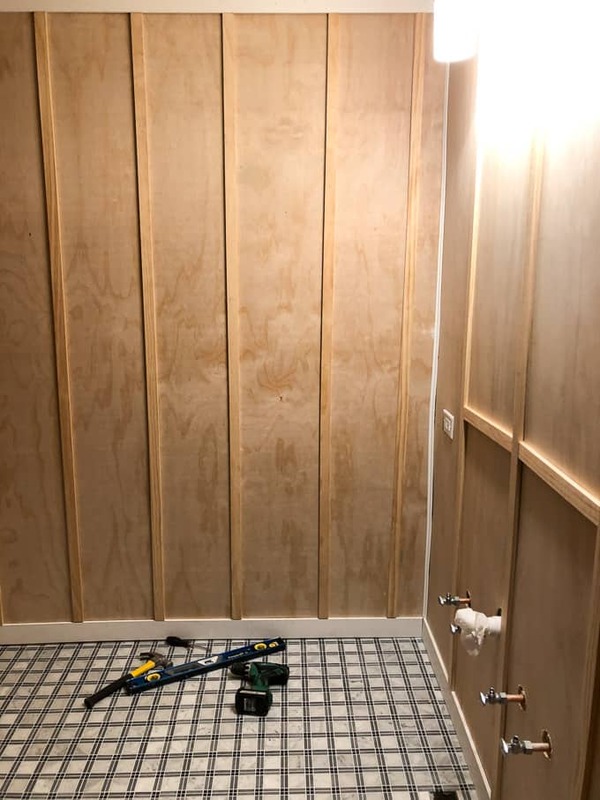 Then using my trim nailer I added baseboard, crown, and vertical battens throughout the bathroom. The hardest part was figuring out how to space them to cover the seams, and how to cut the plumbing holes precisely. Once it was all installed I used a LOT of caulk on all the seams. For a more detailed board and batten tutorial check out how I installed it in our dining room. Then I painted it all with a coat of Nautica “Ice Water”. I literally figured out the paint color as I was polling facebook and instagram as I walked into the hardware store. I had considered a deep green but in the end I’m so happy I went with this warm gray. Now, I’m at the point where I need to figure out where to go from here! After spending the morning scouring the internet, I think I’ve figured out the rest of the details. I’ve got a bunch of items that will be arriving over the next few days and I’ll be making a trip to Target this afternoon. Now I just have to get moving on that drywall and tiled shower! 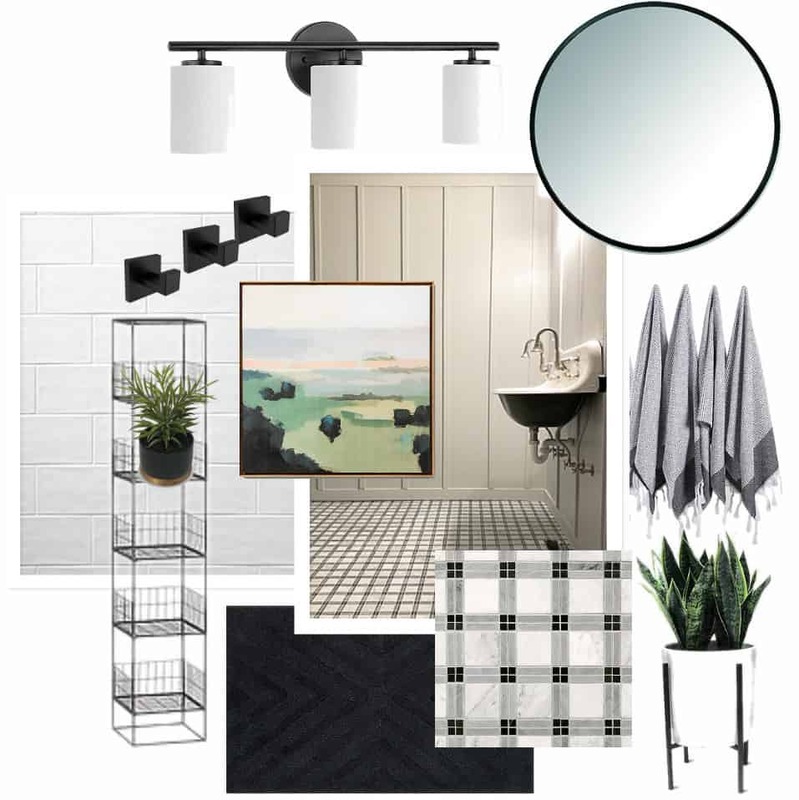 In case you’re interested in the mood board sources, here are shopable links to all of the items! Just click on each image or double click on mobile! So what do you think? Is it too neutral or are the neutral colors calming? Do you think I should install a small shelf above the farmhouse sink? Do you think I’m totally crazy to start into a major project like this without a clue which direction I’m going?! Either way I appreciate you reading and stopping by today! Wish me luck getting this knocked out in these final six days of school! I love this idea! I just moved into a house that needs major updating.I love,love the plywood & batten. 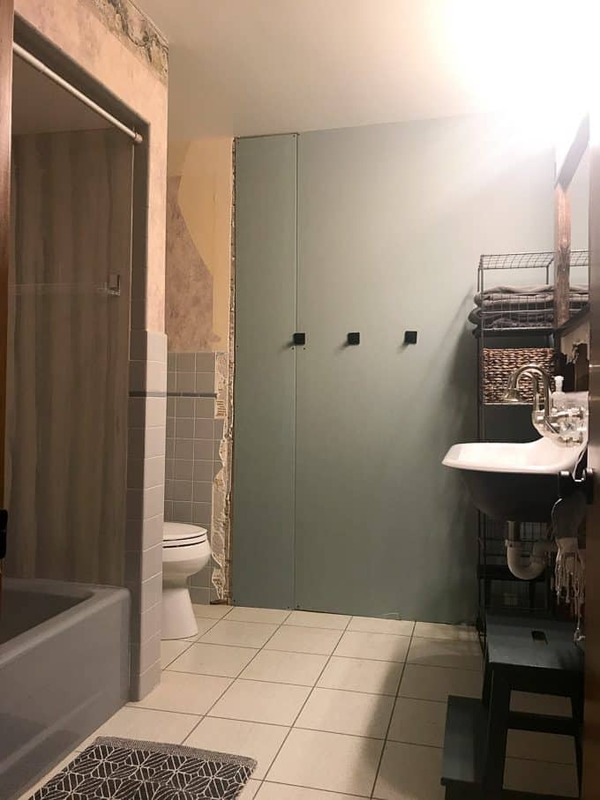 You have inspired me to do the same .I have to cover up ugly tile or paint it I thought as a lifelong DYI’R I would be overwhelmed. You are 1st person I’ve ever commented on their project. BRAVO 2 you. Well done!!! Thank you again 4 the inspiration. You have saved me much work.